Thank you for choosing True€¢B6 by Lidtke. We sincerely wish the best of health for you and your family. 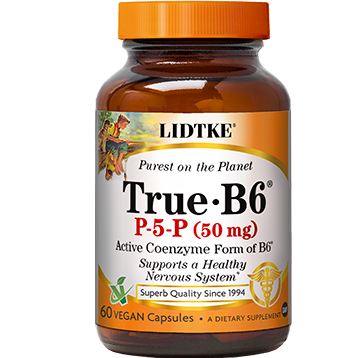 Lidtke True€¢B6 is made from the finest quality Pyridoxal 5-phosphate, the natural form of vitamin B6 used by hundreds of cellular processes in our body. * Vitamin B6 is critical to our production of neurotransmitters and proteins, both necessary for normal mental and physical health. * Vitamin B6 is now recognized for its benefits to cardiovascular health. * No added gluten, yeast, wheat, corn, soy, rice,dairy, eggs, tree nuts, peanuts, fish, shellfish, sugar, artificial color or flavor, or preservatives. Non-GMO.